Mangaluru, Aug 26, 2015: State Minister for Forest and Ecology and DK District in-charge Minister B Ramanatha Rai has drawn flak from environmentalists for his recent remarks regarding the controversial Yettinahole project. 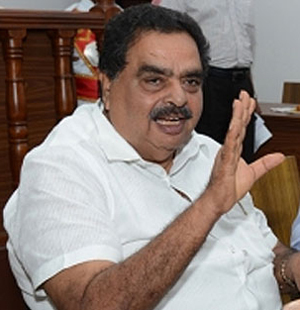 The Minister while participating in an interaction programme of the Kanara Chamber of Commerce and Industry had said that there has been no violation in the works on the Yettinahole project taken up in Sakleshpur. The Minister had also claimed that only preliminary works were taken up. Kishore Kumar of Malnad Janapara Horata Samithi who spoke to a team of journalists who visited the project site, said the minister was trying to project it as a drinking water project work and added that hundreds of trees off the Bengaluru-Mangaluru NH have been axed for the sake of the project. Even teh work of constructing a dam is progressing, he added. Sahyadri Samrakshana Sanchaya Convenor Dinesh Holla who also spoke drew the attention of the scribes towards the allegation of some residents of the area that the government took undue advantage of the closure of the Shiradi Ghat for road repair works recently by building a check dam and excavating earth at many places using massive equipment.